Experience Relais & Châteaux luxury and elegance by escaping into a world of gracious hospitality, elegant amenities, and exemplary service. Built in 1898 by Eugene Langdon Wilks, Langdon Hall was intended to be a “summertime contrast to life in New York, London, and a chateau in the Loire Valley” of France. This country retreat offers 60 luxurious and spacious guest rooms and suites, many of which are decorated with antique furniture. Some rooms also feature private terraces with views of the stunning gardens. Find many other amenities including an outdoor swimming pool and 12 km of walking and biking trails on the property. The Spa at Langdon Hall works to ensure all guests enjoy their spa services. 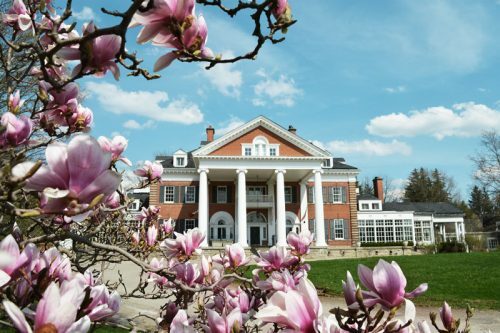 Additionally, all spa guests are welcomed to utilize other Langdon Hall amenities including a whirlpool, sauna, indoor exercise room, tennis courts, and croquet lawn. Reservations are required for all spa treatments and services. The Five Diamond Award-Winning restaurant features carefully crafted cuisine from Executive Chef Jason Bangerter using produce grown on the property, as well as from local farmers, foragers, and artisans. The menu changes with the season, depending on the availability of locally grown and sourced ingredients. For in-room dining, room service is available from 12:00 p.m. to 9:30 p.m.
Langdon Hall’s Head Sommelier, Faye MacLachlan, has curated over 1,000 wines from across the globe and staff has been trained to help guests find the perfect wine to suit their palate. Located one hour from Toronto, London, and Hamilton, Langdon Hall provides the perfect setting for small business or corporate meetings. Their scenic landscapes and elegant reception rooms serve as the perfect backdrop for weddings and special events. The grounds and gardens have undergone extensive work to restore them to their original Victorian magnificence. Plan your visit to Langdon Hall Country House Hotel & Spa – a place where time seems to stand still. Take your golf game to Whistle Bear Golf Club, a 178-plus acre course located on a 232-acre property. With a 40,000 sq. ft. clubhouse, restaurant and bar, fitness centre, and pro shop, it's one of the region's top golfing destinations!